LE-STER! LE-STER! The Ace We’ve Been After? 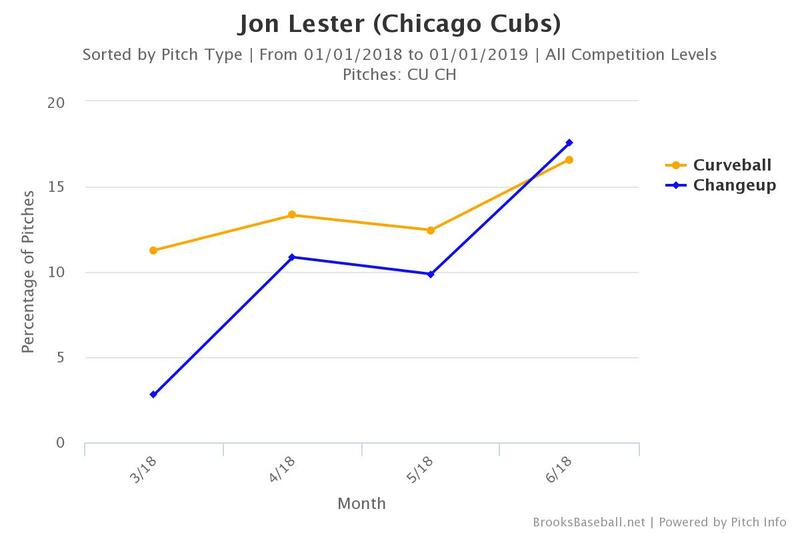 It probably wouldn’t be healthy to think about where the Cubs might be if Jon Lester weren’t having a terrific season. Hendricks has been homer happy and innings-short. 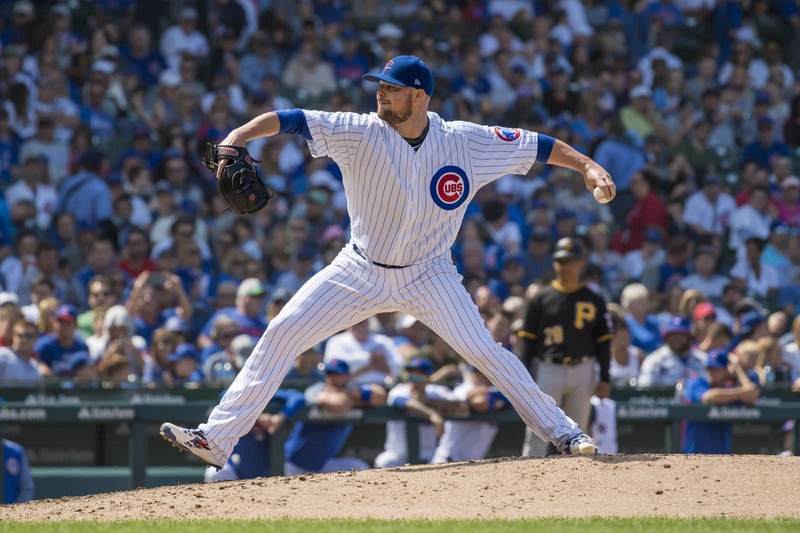 Quintana has been up and down, Darvish has been ouch-y and wonky and maybe a couple other -ys, and Tyler Chatwood has been performance art for the drug-addled. So Lester has held the ship up, and it’s something he’s done before. But let’s get into the nuts and bolts of it. It’s not that Lester has ever been bad. One of the remarkable things about Lester is that he’ always had a plus season, except for one out of his 12 in the majors. Consistency is hard to find. 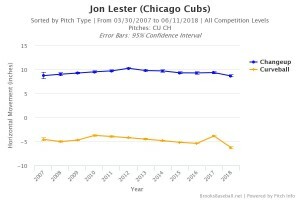 But the past five seasons, Lester has alternated from being good to excellent. His 2014 season, the one that saw him traded to Oakland and then into free agency, was an excellent one. 2.46 ERA, 2.80 FIP, 4.7 WARP. It’s what got him his bumper deal from the Cubs. His 2015 can be viewed in a couple different ways. 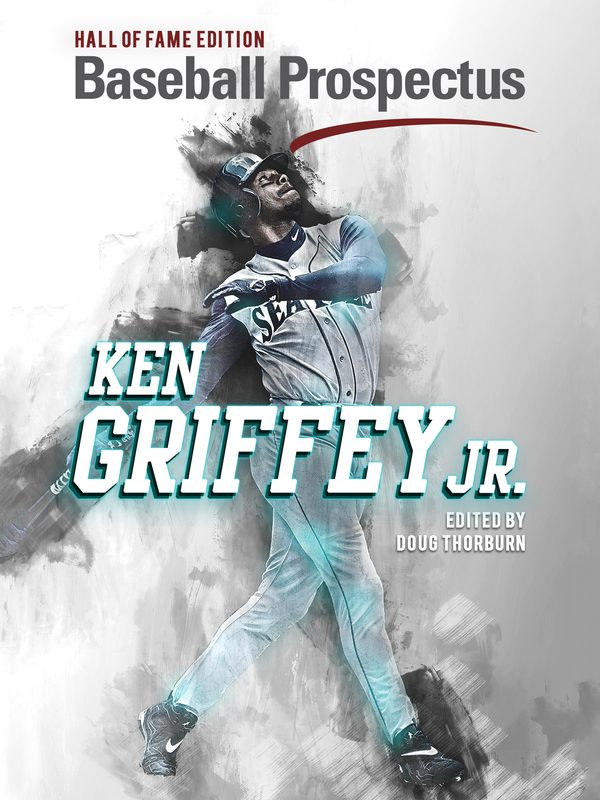 According to Prospectus, his WARP went up, but according to FanGraphs it went down. His ERA was definitely up, and so was his FIP, but his DRA- and DRA were both better than his ’14 campaign. And it’s mostly agreed that his 2016 was excellent: His ERA was a minuscule 2.44, but his FIP shot up to 3.44 and his DRA and DRA- stayed about the same, and based on whichever WAR you use it basically stayed the same. Last year was unquestionably a step back. And this season seems to be reflecting his ’16, in that the overall results are there but the steps there might be hard to hang onto. In 2016, Lester had a magnificent 84% left-on-base percentage, and this year it’s exactly the same. Now hey, that’s not just luck, and I don’t want to tip the gods that much because quite frankly I’m out of small animals to sacrifice. 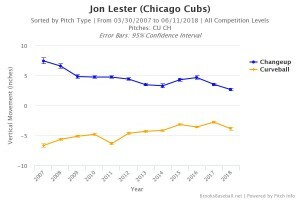 In ’16 Lester gave up a .209 average, and this year it’s .204. When you’re not giving up a lot of hits overall, you’re going to strand a lot more runners because teams just aren’t stringing hits together. Keep the ball in the park, as Lester has this year, and runners are going to stay right where they are. Still, Lester’s strikeouts are down, and his walks are up from 2016. More worrisome, his hard-contact rate has gone up to 34% from 28% last year and 26% the year before that. And yet it’s been swallowed up in a .238 BABIP. And that’s just not going to last, or at least you wouldn’t think it would. 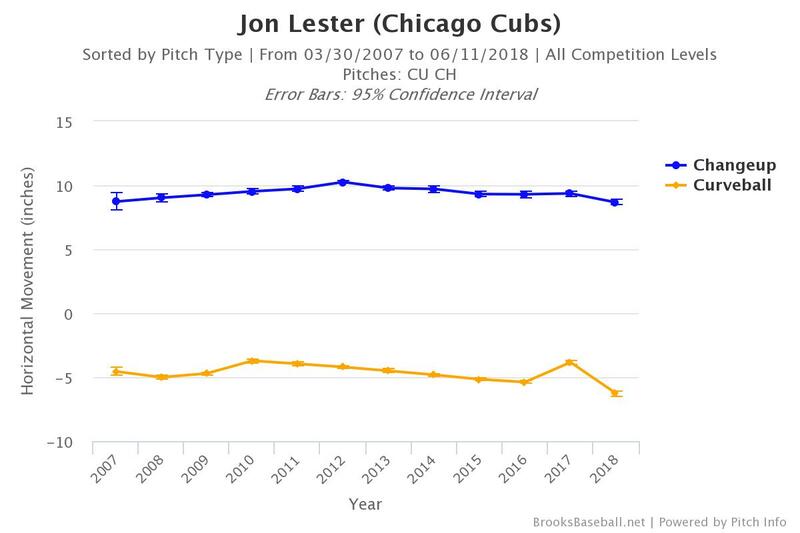 And especially with Lester striking out less, giving up more hard contact, there are just more balls being put in play off of him than there have been in the past. It’s not exactly a house of cards, but the foundation isn’t all that solid either. Now look, Lester hasn’t found some magic elixir when runners are on base to explain his ability to leave them feeling deserted and alone when the inning ends. 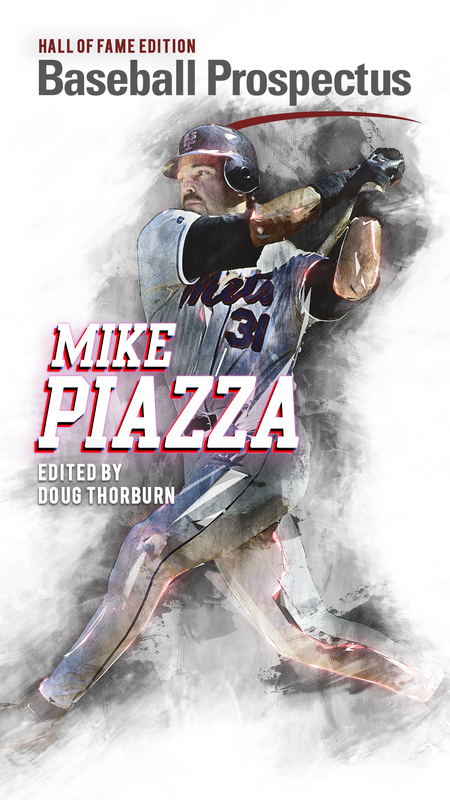 His strikeouts go down and his walks go up when there are runners on, but he does have his ground-ball rate shoot up from 37% with the bases empty to 41% with runners on. 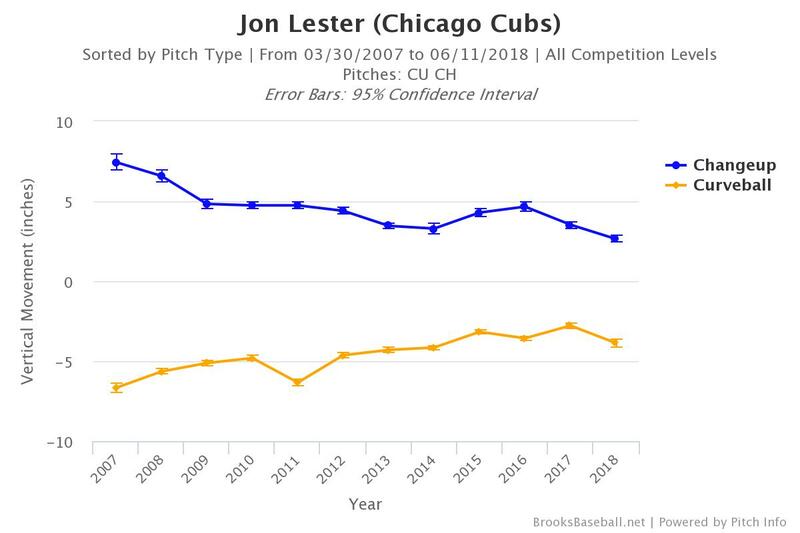 He also lessens his hard contact rate from 40% with the bases empty (yikes) to 23%, though that goes back up when runners are in scoring position, which to be fair to Jon, they aren’t all that much. 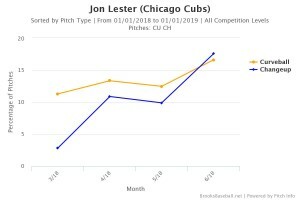 While Chatwood has been the real high-wire act this season in the Cubs rotation, Lester is spinning some plates as well. He’s been able to keep them on the stick for a whole season before, and the Cubs need him to now again. But that’s harder to do when you’re older. Stay tuned.